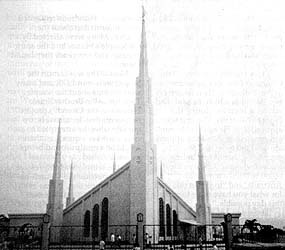 Despite typhoons, volcanic eruptions, and an earthquake in the islands during the days preceding its dedication, the Manila Philippines Temple stood unaffected, serene and beautiful, for the events of September 25–27 which made it the Church’s twenty-ninth operating temple. He also expressed gratitude for the restoration of the gospel, and for “the coming forth of the Book of Mormon as another witness of the reality and divinity of the Lord Jesus Christ. We thank thee for the promise found therein that in the latter days thou wouldst remember thy children on the isles of the sea. He requested spiritual and temporal blessings for the Saints everywhere, and then for the leader of the Church on earth. He expressed love and gratitude for the generous blessings of a Father in Heaven and a divine Redeemer. “We thank thee for this beautiful edifice and for all who have worked to make it possible. May it stand as a pillar of truth and as an invitation for all who look upon it to learn of the purposes for which it has been created,” he continued. In his remarks prior to the dedication, President Hinckley had praised the Philippines as a “nation of heroes” who stood for what they believed in, and pointed out that a boy or girl of twelve could take the role of just such a hero by being baptized for his or her kindred dead. D. Arthur Haycock, personal secretary to President Kimball, brought the Filipino Saints a message of love from the President during the dedicatory services, and he reminded the youth of Spencer Kimball’s determination as a deacon that he would never waver from the gospel standards of honesty and morality he had been taught. He said President Kimball asked that the young boys of the Philippines keep in their homes a picture of the temple in Manila as a reminder that they would go there prior to leaving on a mission, be married there, and be baptized for the dead. There were nine dedicatory services during the September 25–27 period, attended by some 6,500 Saints representing sixteen stakes and twenty-two districts in the Pacific Area, presided over by Area President William R. Bradford with his counselors, Elders Jack H. Goaslind and Robert B. Harbertson. Prior to that first service, the cornerstone of the temple was sealed by President Hinckley, assisted by Elder Marvin J. Ashton and Elder L. Tom Perry of the Council of the Twelve; and Elder Wm. Grant Bangerter, Elder William R. Bradford, and Elder Jack H. Goaslind, Jr., of the First Quorum of the Seventy. During the cornerstone ceremony, President Hinckley commented on the beauty of the temple and praised the craftsmanship that went into building it. His feelings had been echoed by many of the nearly 27,000 members and nonmembers who toured the temple before its dedication. They came despite two typhoons that had ripped through the Philippine Islands, some forty-eight hours apart, a few days before the open house was to begin. Saints from distant provinces arrived via minibus, very weary, but buoyant. In many cases they had been forced to take circuitous routes to Manila because roads had been flooded and bridges damaged by strong currents in overflowing rivers. Nature had, in fact, been putting on an impressive show in the days preceding the temple dedication. As a follow-up to the typhoons, Mayon volcano in the Bicol Peninsula erupted, spewing ash and flames up to eight miles high, midway through the temple’s open house period. Then, two days before the dedication, a strong temblor rocked northern Luzon. Members of the Church were largely unaffected by the destruction from these natural catastrophes. The 13,800-square-foot temple is situated on a five-acre hilltop plot along a street recently renamed Temple Drive, overlooking the Marikina Valley. Visitors who toured the edifice seemed to appreciate its physical beauty; many were moved by the spirit they felt. The temple’s four ordinance rooms and three sealing rooms can now offer eternal blessings to Saints in a temple district that includes Indonesia, Malaysia, Thailand, and Singapore. For most of the individual members involved as volunteers in the dedicatory activities, the opportunity to enjoy temple blessings is the answer to many prayers. The Manila Philippines Temple is located on newly renamed Temple Drive. Francis Orquiola is bishop of the Quezon City Third Ward, Quezon City Philippines Stake.